Telkomsel’s voice and SMS revenues finally succumbed to cannibalisation by data and competition from XL Axiata and Indosat. Bharti Airtel faces intense competition from Reliance Jio, which garnered 160m mobile subscribers and turned profitable in the second quarter of commercial operations. We have reduced our projection for earnings contribution from associates by 4.9%, offset by strong growth from Optus in Australia. Maintain BUY and target price of S$4.35. Trend reversal for legacy voice and SMS. Revenue from legacy voice and SMS, the mainstay of revenue outside Java, has finally succumbed to cannibalisation by data and competition from XL Axiata and Indosat. Revenue from voice expanded 8.7% y-o-y in 1H17 but reversed to a decline of 7.2% y-o-y in 2H17. The decline in revenue from SMS started earlier with a contraction of 7.9% y-o-y in 2H16. The decline accelerated to 14.1% y-o-y in 1H17 and 21.7% y-o-y in 2H17. Its previous strategy of promoting usage for voice and SMS has ceased to deliver the goods. Competition moderates data-driven growth. Data traffic continued to increase at a triple-digit rate of 127% y-o-y, bolstered by customers migrating from pay-as-you-use to flash data packages. The number of data users and smartphone users have also increased at a faster pace of 24.9% and 30.9% y-o-y respectively, compared to growth in mobile subscribers of 12.9% y-o-y. However, the effective pricing for data has declined 41.5% y-o-y to Rp14/MB in 4Q17 due to migration to flash data packages and competition from XL Axiata and Indosat. Revenue from data, its main engine of growth, has increased 32.7% y-o-y in 3QFY18. Expenses to normalise after surge in 3QFY18. EBITDA margin was seasonally lower at 54.1% in 4Q17 compared to 58.7% for 9MFY18. Operation & maintenance (O&M) expenses increased 10.8% y-o-y due to accelerated network expansion and higher frequency fees for its new 2300MHz spectrum. Personnel and marketing expenses were seasonally higher and increased 31% and 74% q-o-q. EBITDA margin should normalise upward as expenses recede in 4QFY18. Reliance Jio no longer offers free services. Price competition from Reliance Jio has vacillated over the past one year. It raised its effective pricing for 4G service plans by 15-20% in Oct 17. It reduced the validity period for its most popular Rs399 plan with daily data of 1GB from 84 days to 70 days. In Jan 18, it changed track to cut effective pricing by 10-25%. Its charges for Rs399, Rs449 and Rs499 packages with daily data of 1GB were reduced by Rs50 to Rs349, Rs399 and Rs449 respectively. It also introduced new 4G service plans with daily data of 1.5GB at Rs398, Rs448 and Rs498 for validity periods of 70, 84 and 91 days respectively. We estimate that Reliance Jio is currently pricing at a discount of about 15% relative to its larger peers. Reliance Jio has turned profitable. Reliance Jio achieved net profit of Rs5,040m during the second quarter of commercial operations (Oct to Dec 17). It clocked net addition of 21.5m subscribers to bring its subscriber base to 160.1m as of Dec 17. Its subscribers consume 9.6GB of data on average per month (Bharti Airtel: 5.3GB), including 13.4 hours of video. ARPU was stable at Rs154 (Bharti Airtel: Rs123), a testimony to the quality of its subscriber base. Bharti Airtel benefits from industry consolidation. Atrocious pricing erosion caused by the entry of Reliance Jio has triggered the demise of many small players. This turned out to be a blessing in disguise for Bharti Airtel as it was able to acquire assets from Telenor India and Tata Teleservices at distressed valuations. Bharti Airtel acquired 52.5m subscribers and 43.4MHz spectrum in the 1800MHz band, to be refarmed for 4G, in seven densely populated circles from Telenor India in Feb 17. The assets were acquired on a cash-free and debt-free basis with Bharti Airtel responsible for only future payments for spectrum and telecommunication towers. Bharti Airtel also acquired 44m subscribers and 178.5MHz of spectrum in the 850MHz, 1800MHz and 2100MHz bands across 19 circles from Tata Teleservices in Oct 17. The assets were acquired on a cash-free and debt-free basis and Bharti Airtel only needed to pay Rs20b to the department of telecommunications (DoT) for unpaid spectrum liabilities. Bharti Airtel’s revenue market share is expected to increase from the current 30% to 32-35% over the next two years − Aircel, the sixth-largest player with 88m subscribers, has filed for bankruptcy in Mar 18. It has incurred persistent losses and was burdened by huge debt pile of Rs155b. Unlocking value from divestment of Bharti Infratel. Bharti Airtel set up a committee of directors (COD) in Nov 17 to evaluate the divestment of Bharti Infratel. It subsequently sold 83m share representing a 4.5% stake to rake in Rs33.3b (US$510m), which would be used to pare down its net debt of Rs1,038b as of Dec 17. Bharti Airtel and its subsidiaries still own 53.5% of Bharti Infratel after this transaction. Share price decline caused by sector rotation. 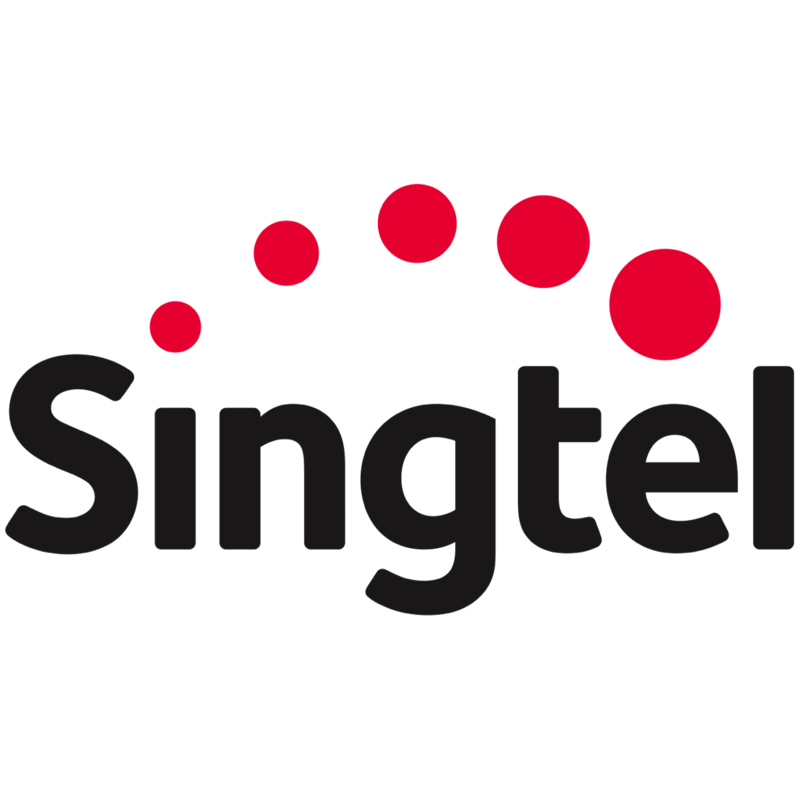 Singtel’s share price corrected 5.6% in 1Q18. This is part of a global switch from defensive to cyclical stocks (AT&T -8.3%, Verizon -9.7%, Sprint -17.1%, Vodafone -17.4%, BT Group -16.3%, Orange -4.8%, Telenor +0.6%, Telefonica -1.2%, Deutsche Telecom -10.4%, Nippon Telegraph & Telephone -7.6%, NTT Docomo +2.1%, Softbank -10.9%, China Mobile -9.2% and China Telecom -7.0%) due to expectations of robust growth for global GDP prevailing then. Given recent concerns on geopolitical tension over trade conflicts, we do not expect a similar repositioning of portfolio to be repeated in the near term. Regional mobile associates growing at a slower pace. Singtel is affected by slower growth at Telkomsel. Earnings contribution from Bharti Airtel remains under pressure due to cuts in tariff instituted by Reliance Jio in Jan 18. Based on financial results for 3QFY18, Telkomsel and Bharti Airtel accounted for 27.9% and 3.2% of group pre-tax profit. Our net profit forecast for FY19 is unchanged as moderation in earnings contributions from regional mobile associates was offset by strong growth from Optus in Australia. We roll over our valuation to FY19. Our target price of S$4.35 is based on DCF (required rate of return: 6.5% (previous: 6.25%), growth: 1.5%). Maintain BUY. Singtel is the least affected by a fourth mobile operator in Singapore as overseas businesses accounts for about 70% of its bottom line.